NEW YORK (AP) — Joe Delaney grew up in New Jersey listening to Notre Dame games on the radio with his father, who — like many blue-collar Catholics at the time — never stepped foot on the school’s campus but was passionate about its football team. The Fighting Irish were regular visitors to the New York area during the first half of the 20th century, when their wanderlust turned Notre Dame football into America’s team. Notre Dame’s famous Four Horsemen rode through upper Manhattan in 1924 at the Polo Grounds. When Knute Rockne implored the Fighting Irish to “Win one for the Gipper” in 1928, it was at Yankee Stadium in the Bronx. The Fighting Irish played mighty Army every season from 1923-46, all but once in New York City and 21 times at Yankee Stadium, cultivating a huge following of so-called Subway Alumni — like Delaney. The third-ranked Irish return to their East Coast stronghold Saturday to face No. 12 Syracuse (8-2, No. 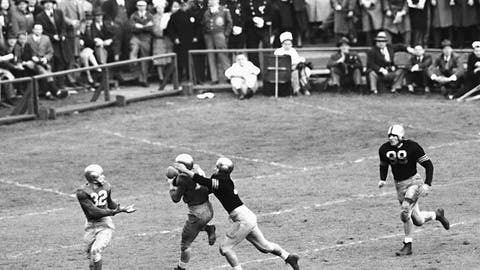 12 CFP) in the highest-stakes college football game played at Yankee Stadium since the 1946 Game of the Century between No. 1 Army and No. 2 Notre Dame . These Fighting Irish (10-0, No. 3 CFP) also bring national championship hopes to the Big Apple, two victories away from likely securing a spot in the College Football Playoff. Plenty of Notre Dame supporters are upset such an important game, so late in the season, is being played away from South Bend, Indiana, forcing the Irish to travel to the East Coast this week and then the West Coast next to play Southern California. That will be the second trip to California for Notre Dame in five weeks. Delaney, like most Notre Dame fans, is concerned about how all that travel will affect the players, but there is no doubt in his mind the Fighting Irish will have a home-field advantage to feed off at Yankees Stadium. This game is part of Notre Dame’s Shamrock Series , an almost annual off-site home game the Fighting Irish have played since 2009. It’s a nod to Notre Dame’s history of adventurous independence and the vision Jesse Harper, the coach of Notre Dame’s first great teams, had for turning a small Catholic school in the Midwest into a national powerhouse. Notre Dame played Army in a Shamrock Series game in 2010 at the new Yankee Stadium and a return trip had been in the works for a while. With Syracuse on the schedule as part of Notre Dame’s deal with the Atlantic Coast Conference, this seemed like the ideal season to come back. The problem was it created a schedule in which Notre Dame played just one game in its own stadium over the last five games of the season. Further complicating the situation, Notre Dame’s annual game against Navy was set to be played in San Diego on Oct. 27. When the Navy game was slotted for a night-time kickoff, Swarbrick considered the possibility of bringing the Syracuse game back on campus. After conferring with coach Brian Kelly, it was decided to leave it as is. Everybody involves knows it is not ideal. The Irish have been tweaking routines, Kelly said, with an eye toward this late-season grind. The team stayed overnight in San Diego after the Navy game and tried to stay on Eastern time. One loss could doom Notre Dame’s playoff chances. If it comes in Yankee Stadium or on the back end of consecutive games away from home, you can bet Swarbrick and his Shamrock Series will be blamed by some fans.